Already have a LinkedIn profile? Good! Perfecting your LinkedIn profile is the first step to finding freelance clients through that network. That’s not merely enough, though. With over 380 million users already on LinkedIn, you are in for a tough ride if you rely solely on your profile to land writing gigs. How you handle yourself on the network and how you communicate with your connections is far more important for your success on LinkedIn. Nobody likes to be sold to and that’s particularly true for LinkedIn. 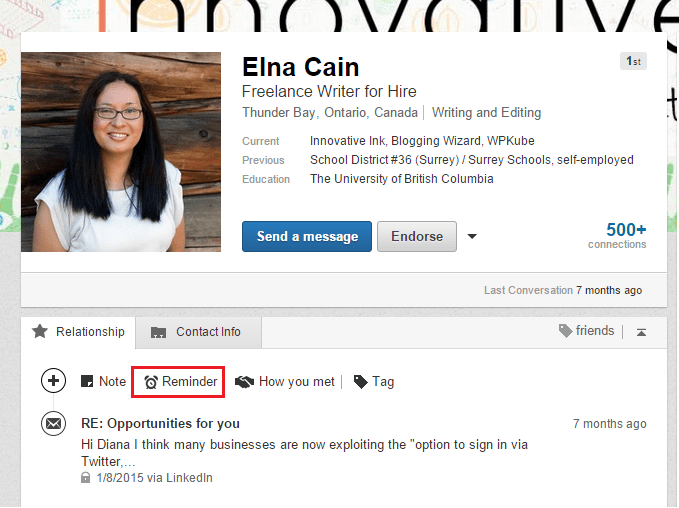 Lucky for you, most freelancers – including writers –make pretty much the same mistakes when prospecting on LinkedIn. They send a default connection invite, wait for the other party to accept without saying anything, and then send a cold sales pitch or a writing sample, hoping they’ll solicit some work. But they rarely do. Do you know why? This post is NOT about teaching you how to write a sales pitch or helping you choose the best writing sample to send. It’s not about warm pitching, cold pitching, or lead generation either. It’s about changing your perspective and showing you where the real power of LinkedIn lies – online networking and more importantly, relationship building. Think about it – it’s not a coincidence that LinkedIn is the only social media site where you build a “network of connections”. Not followers, not likes, connections. To stand apart from the crowd and land freelance writing projects through LinkedIn on a regular basis, you should adopt the proper attitude and behavior on the network. And that’s good old-fashioned relationship building – when you genuinely take interest in the other person without expecting to get something in return. People Don’t Like Working with Strangers – So Don’t Be a Stranger! Introduce yourself, take interest in others, offer your help, ask for something that would cost them no time or effort but will help you improve. People like when they feel useful – make them feel good about themselves and they will like you back for that. Build relationships with prospective clients who would remember you and get in touch when they need a service you offer. Build relationships with fellow freelance writers who’d recommend you to a prospective client when they are too busy to take on the contract themselves. As I said, a common mistake freelance writers make is to connect with someone and instantly send them a description of their writing services or even worse, a writing sample. “Hi, Diana, I am extremely pleased/honored/thankful/thrilled to be part of your network. Now that we are connected, I’d like to take the opportunity to tell you a little bit more about myself and what I do. These people never asked me what I do and if I work on a project that needs a writer. They just assumed I must have work for them. I will never hire a freelance writer who handles the communication with prospects this way. Sending me such a message the moment I connect with them tells me their sole purpose of being on LinkedIn is soliciting work. They have no interest whatsoever who I am, what I do, what I need, and how we can benefit from each other. They are solely interested in getting hired. Furthermore, they probably send this message to every single connection they add to their network. This doesn’t make me feel special. As far as I can see, they don’t want to work with me. They simply want to work with whomever is willing to hire them. In my eyes, as a prospective client, the lack of personal approach questions their integrity as professional writers. If their messages are so impersonal now, what am I to expect of their writing when they know they will get paid? Soliciting work through LinkedIn is not a bad thing. Sending a description of your services isn’t a bad thing either. But only if you do it right. If you want to have a healthy relationship with a good client who pays top dollar for your writing and on time, I strongly recommend you take the time to get to know them first and offer your services only when you know they’d be interested now or in the future. Otherwise, you risk putting off that prospect and never hearing from them, even when they need a service you offer. The way you approach your potential connections says a lot about you – are you just sending bulk messages to everyone who has a distant connection with you? Or are you nurturing a healthy network of connections on LinkedIn? Do you care or do you spam? Are you after quality or quantity? How you handle yourself on LinkedIn suggests to potential connections (and prospective clients) what type of a professional you are. You may be a brilliant freelance writer but if you lack business and communication skills, you won’t enjoy much success on LinkedIn. Sending a personal message lays a good foundation to the relationship building process that is to follow. When writing a customized invitation to connect, you demonstrate your interest in the other party – you took the time to check their profile, to find what you have in common, and to extend an invitation to get to know each other better. Once a prospect accepts your invitation to connect or replies to your message, look through their profile and ask questions about them. This will make the other person feel important – and who doesn’t like that! Just make sure you are engaging them about something you are genuinely interested in – you’ll be made if you’re faking it, I promise. Alternatively, you can ask about something you have in common. For example, a few months ago I connected with someone who used to play the violin and was on their high school volleyball team. Rather unusual combination (playing an instrument and devoting oneself to sports in the same time) but I used to do both as well so it was a great ice breaker. Bottom line – ask a question or share a story which your potential connection could relate to. The goal is to get them talking to you so you can start getting to know each other better. Use these initial messages to bring the conversation to the next level. After you exchange a few messages, the conversation would probably seize. That’s normal – it’s a professional network after all, not a chat. There’s only so much you could talk about without wasting time. When that moment comes, add a reminder to follow up with them. You can do that by going to the person’s profile and clicking the ‘Reminder’ text link. You will have the option to add a note to remind yourself what is it that you want to follow up about and also, set the timing of the reminder to 1 day, 1 week, 1 month, or recurring. Just make sure you check your reminders on a regular basis because LinkedIn does not send email notifications about them. To see your due reminders, go to ‘Connections -> Keep in touch’ from your main navigation. When you do follow up, ask them how they are doing and continue building the relationship – say something that relates to your last message or some news around you that would be of interest to them. For example, a few months ago I had a conversation with a girl who was just making her first steps in the freelance world. A reminder to follow up with her came up and it just happened so that I had a freelance 101 coaching contest open on my blog where she could win a free coaching session with me, if she decided to enroll. So I followed up with her, inviting her to apply for a free consultation, if she was still struggling with making those first steps as a freelancer. This three-step formula applies when someone invites you to connect, too. Just pay attention how they approached you. Did they send you a customized message? If they didn’t, better don’t accept right away. Ask for their reasons to invite you to connect. This way, you will make sure to keep your network of connections healthy and avoid all the spam and fake profiles coming your way. Consider this an investment in your freelance business. I know networking and building relationships on LinkedIn can be time consuming. But so is prospecting. Your goal should be getting repeat business and referrals from clients and fellow freelance writers. So consider this an investment in your freelance business. Spending less than 30 minutes every day building and maintaining relationships on LinkedIn can help you build a strong network of people, willing to work with you and to send business your way when the need arises. Diana Marinova is a freelance marketing consultant by day and a passionate traveler by heart. She blogs and writes books to help fellow freelancers live their dream lives and maintain a work-life balance. For more, check Diana’s Freelance Marketing Blog. Diana – thanks for this clarification. I created a LinkedIn profile about a week ago, and now I know what *not* to do and how to make better connections. Awesome, Annette, I’m glad I helped you get started with LinkedIn on the right foot. Diana — excellent posts with tips about how to use LinkedIn. It’s disheartening to look at someone’s LinkedIn profile and there’s no photo and no content. Just a placeholder. That is so bad for their professional reputation.